An old front will be stalled in the northern Gulf of Mexico as a new cold front approaches from the north. While this brings the possibility of showers on Saturday, we can also expect the coolest air so far this fall. Today and Tonight: Warmer, muggier conditions are anticipated Friday with coastal rain chances increasing late. 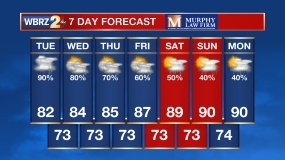 Highs will be in the mid to upper 80s. Overnight will be mostly cloudy with spotty showers and lows in the upper 60s. 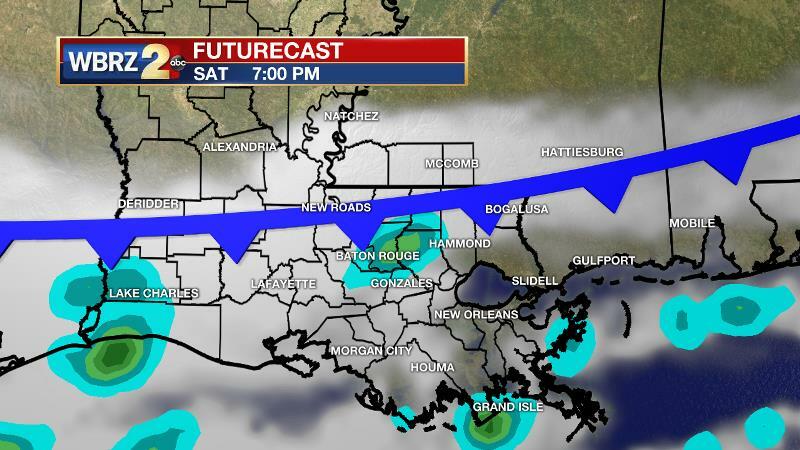 Up Next: Saturday will be busy in the Baton Rouge area as it is homecoming weekend for LSU. A cold front will pass through during the late afternoon hours, possibly stirring up a shower or two. However, precipitation is looking meager with this boundary and some locations could miss rain entirely. Overall, there is no reason to worry about a washout for the parade, tailgate or game. The current worst-case scenario appears to be a rain shower. The front should pass around dusk allowing northerly winds to cool temperatures down in a hurry. Along with a precautionary poncho, you may consider taking a light jacket into the game as the 10pm temperature will be in the mid 60s. Meanwhile, in Dallas, the Southern Jags will compete under partly sunny skies with thermometers near 70 degrees. By Sunday, the cold front will be south allowing sunshine and the coolest air of the fall season thus far. Highs may fail to escape the 60s on Sunday and Monday and the new week will begin in the upper 40s. The Tropics: The Gulf of Mexico, Caribbean Sea and Atlantic Ocean are quiet. No tropical development is expected over the next 5 days. High pressure will remain over the forecast area through Friday. The remnants of a stalled front in the northern Gulf could spew a few showers across coastal areas. A deep trough will dig into the Eastern U.S. on Saturday with its axis guiding a cold front through the region on Saturday. Forecast model precipitation output has been decreasing through the week and, at this time, only anticipate a broken line of showers to accompany the front. Therefore, many locations may miss rain as the boundary crosses. Instability will remain low so do not expect to see much in the way of thunderstorms. Temperatures will generally be near average in the 70s and lower 80s in advance of the front. Behind the front, much cooler temperatures can be expected with the lowest mark of the fall season thus far likely met on Monday morning. Most stations north of I-10 should sneak into the upper 40s. The region should stay fairly dry though Wednesday. Guidance then struggles with what happens next. Both the GFS and ECMWF show upper level energy moving out of Texas and developing into a robust system that could bring a chance for strong storms. The ECMWF has just shown this outcome, while the GFS has been showing this system for a few days. It will be something that needs watched as it could be the first strong system of the cool season.